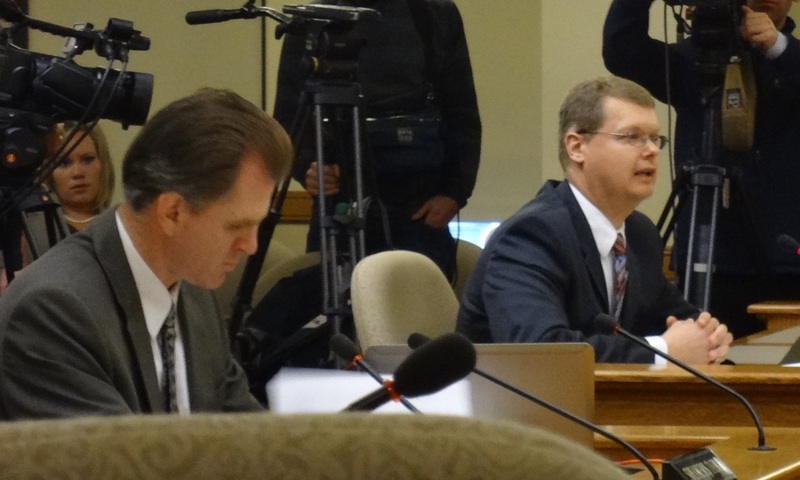 On Friday, March 30 the Government Accountability Board met to certify the recall petitions of four Republican senators, the Lieutenant Governor and the Governor of Wisconsin. Also on the agenda was a proposal to create and make public a searchable database containing the name of every person who has signed a recall petition for those six elected officials, including links to scanned facsimiles of the actual petitions which contain address and e-mail information. Michael Screnock, attorney for the Walker campaign, addresses the board as GAB attorney Michael Haas looks down. As expected, all recall campaigns were certified as successful. 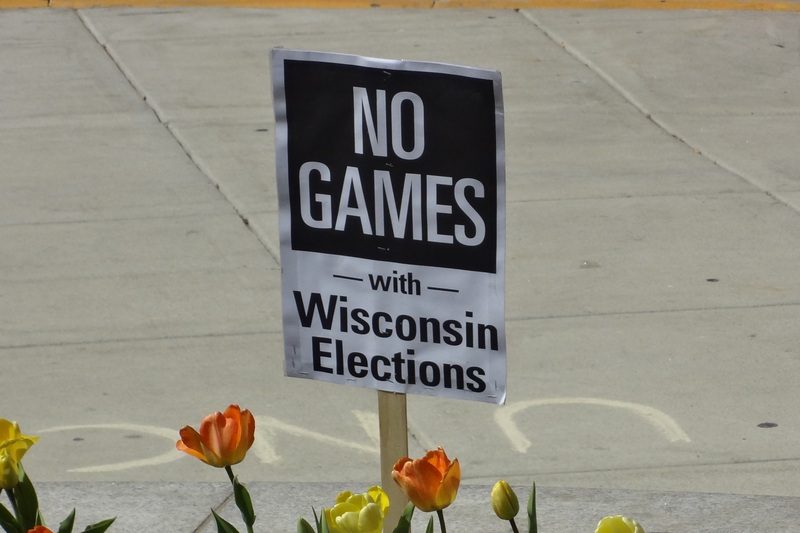 GAB member Judge Brennan noted that there was, “virtually no fraud” in the petitions, noting that only four of nearly one million signatures to recall Scott Walker were deemed “fake.” Election dates were set for May 8, and in races where there are primary challenges, primaries will be on May 8 and elections will be on June 5. The Republican Party of Wisconsin has announced that it will run “protest” candidates as Democrats in primaries so that all of the elections will occur on June 5. All “protest” candidates have now been identified. The one running against Senate Majority Leader Scott Fitzgerald’s challenger, grassroots candidate Lori Compas, is Gary Ellerman who made this silly anti-recall video in support of Scott Walker’s re-election. The six retired judges who serve on the board took up Director Kevin Kennedy’s proposal to create and make available to the public a searchable data base of the recall petitions. This proposal came as the result of the Republican Party of Wisconsin’s lawsuit against the GAB last December in which they asserted that it was the responsibility of the GAB, not of the recalled party, to ensure that every signature was valid. The lawsuit was seen by the recall campaigns as a stalling technique to extend the deadlines for petition certification to enable Walker to raise more unrestricted funds. Under Wisconsin recall law, an elected official’s campaign can receive unlimited donations from individuals between the date the recall petitioning commences and the date that the petitions are certified and an election date is set. Once the recall is certified, campaign donors are limited to $10,000 each. The rationale for unlimited fundraising for elected officials targeted for recall is quite specifically to enable them to amass the resources to verify and challenge signatures on petitions in a short period of time. As of January 17, 2012, the Walker campaign had raised $12.1 million. In filing the lawsuit against the GAB, the Walker campaign wanted it both ways: They wanted the ability to raise unlimited amounts of money, but they didn’t want to do the work or pay for the verification of signatures on petitions. Sign posted at the Capitol. Despite the fact that Wisconsin Statutes regarding recall petition signatures clearly state that, “the burden of proof for any challenge rests with the individual bringing the challenge,” on January 6 Waukesha County Judge Mack Davis ruled in favor of the Republican Party stating that the GAB, ”must take reasonable, affirmative steps to identify and strike duplicate, fictitious or unverifiable signatures from recall petitions.” That ruling was quickly appealed and ordered to be vacated by a District IV Court of Appeals decision dated February 3, 2012. However, despite the large amount of discretion given by Judge Mack and the subsequent ruling of the appeals court to vacate that order, Kennedy urged the GAB to move forward with doing the work that should have been done by the recalled candidates themselves. The GAB met four days after the appeals court ruling and decided to invest time and resources into verifying and data entering by hand the name and address of every single person who signed a recall petition. Nevertheless, Verify the Recall proceeded to create a searchable database of the names of people who had signed recall petitions based on scanned copies of petitions. Over the past month judges, journalists and private citizens have been publicly criticized, harassed and disciplined for having signed the recall Walker petition. It seems that the real motivation behind Verify the Recall’s activities is to attack Walker’s opponents rather than to protect and ensure the integrity of the recall process. After all, they have no legal standing to do so. In a remarkable statement at the March 12 GAB meeting, the attorney representing the Walker campaign, Joe Olson of Michael, Best and Friederich, said the decision by the GAB to voluntarily comply with Judge Davis’ ruling is the reason Walker did not pursue a Supreme Court challenge to the Appeals Court ruling. Citizens concerned about privacy and personal safety strenuously objected to the proposal for an easily accessible, taxpayer-funded and supported searchable database of recall petition signers. In particular, those with restraining orders out against people felt that the easy access to their information was an unacceptable breach of their privacy. The GAB has spent an estimated $150,000 on creating a massive database of recall petition signers’ information for anyone to use. Both Republican and Democratic parties will benefit from having this enormous, taxpayer-funded mailing list. Meanwhile, the people whose names, addresses and e-mails appear – i.e., “the public” – are adversely affected. These questions remain: Who really wants to know who signed the recall petitions and why do they want to know it? And are their interests really more important than the privacy and safety of individual citizens? The task of the GAB was simply to verify the number of signatures – to ensure that over 540,000 valid signatures to recall Scott Walker had been gathered. They did not have to take the extra costly steps to personally identify each signer. Even Judge Davis’ decision did not go so far as to order that level of scrutiny. The effect of the GAB decision to follow this process has been to give the Walker campaign at least five extra weeks of raising unrestricted funds. While the GAB took transparency and the public’s right to know to an extreme concerning recall signatures, they have not applied the same “balance” to another equally important issue: Scott Walker’s recently initiated legal defense fund. Though he hasn’t yet publicly admitted it, Scott Walker is a likely target in the John Doe investigation into illegal campaign activities taking place in his Milwaukee County Executive office in 2010. Indeed, in order to set up a legal defense fund he has to be under investigation. As the state elections board, the GAB has responsibility for enforcing campaign finance laws, including the one that says legal defense funds must be separate from campaign funds. One would think that these are critical issues about which the public has a right to know. However, GAB staff repeatedly brush off questions with, “no comment” or, “legal counsel says I can’t talk about it.” Even when asked general questions about the processes they have in place to ensure that the funds aren’t used improperly, Kennedy and his staff literally push the questions aside. After the March 12 meeting I had a brief interview with Kevin Kennedy on the topic. See the video here. These questions remain: Who really wants to know how the Walker legal defense funds and campaign funds are being monitored and why do they want to know it? And are their interests really more important than the privacy of a soon to be recalled Governor? The right wing has been very successful “working the refs” at GAB, including the head ref Kevin Kennedy. Extraordinary. At every opportunity, the GAB passes the buck on responsibility. Thanks to Rebecca for literally making this fact visible. This week, Magney said the decision to investigate and prosecute election bribery cases (like, say, presidential candidates and their local lackeys handing out free subs for primary votes) rests entirely with district attorneys. This is patently false. The GAB can refer a case to the local DA for prosecution. If that DA refuses, the case can be referred to another DA and then to the Department of Justice if need be. Then Magney told WTDY that the GAB will not investigate the fake Democratic recall primary candidates because “[the] potential for mischief is part [of the cost of open primary] where the people decide instead of party officials.” Except, you know, it’s the party officials recruiting the fake candidates. The inconsistency is very telling. As Bill said, the Republicans have been working the refs. I’m disappointed by the GAB’s weak-kneed response to the bullying from Walker. The GAB is supposed to be independent, but Kennedy has rarely asserted that independence. I sense a bit of a desire for selfish vindication on his part. He seems only to be concerned about having his staff’s work compared to VerifytheRecall so he can brag about….I don’t know…better data entry skills? When the GAB won’t even talk about their general policies and procedures for ensuring that campaign funds and legal defense funds are not co-mingled, they appear fearful and incompetent at best. Good – I should definitely pronounce, impressed with your web site. I had no trouble navigating through all the tabs and related information ended up being truly easy to do to access. I recently found what I hoped for before you know it at all. Quite unusual. Is likely to appreciate it for those who add forums or anything, web site theme . a tones way for your client to communicate. Nice task. I cling on to listening to the news speak about getting free online grant applications so I have been looking around for the most excellent site to get one. Could you tell me please, where could i find some? This is the precise weblog for anybody who desires to seek out out about this topic. You understand so much its virtually hard to argue with you (not that I truly would want…HaHa). You definitely put a new spin on a subject thats been written about for years. Great stuff, just nice!